Il turismo in Salento è una realtà ormai affermata e possibile tutto l’anno, ma primavera e autunno si prestano in particolare agli itinerari in bicicletta e le escursioni in campagna. 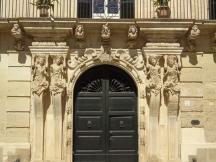 Visitare Lecce è d’obbligo: una guida autorizzata vi svelerà il fascino dei maggiori monumenti e dei vicoli più belli tra palazzi e chiese ricchi di fregi esuberanti. 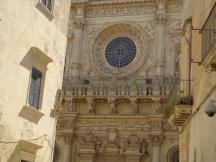 Lecce is a very lovely town, perfect for those who love to wander along narrow streets past noble old palaces, churches and ancient ruins. 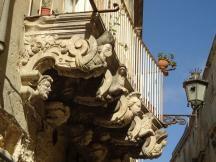 Lecce is famous for its Baroque churches covered with exuberant friezes and decorations carved into the limestone whose soft honey-colored nuances change with the shifting light of day. The center of town boasts two remarkably intact Roman theaters just a few steps from the Holy Cross Basilica and the Duomo square; this last is a rare example of a completely surrounded public plaza, enclosed on every side by magnificent buildings marking Lecce’s varied rulers. For the biker we suggest a lovely ride towards the Marine Reserve “Le Cesine,” passing by Acaia, a tiny village developed inside the walls of the biggest Renaissance estate in the region. Among the most beautiful coastlines in Italy, the route from Otranto to Santa Maria di Leuca is blessed with outstanding views, where the pristine natural landscape is marked only by long stretches of dry stone walls and interrupted by lovely sea villages. You can go by car or bicycle, or you can opt to walk the up- and down- trails by the sea, where you can glimpse the spectacular panoramas of Albania’s mountains. 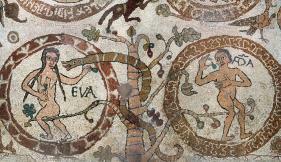 Starting in Otranto the tour will guide you to the cathedral, carpeted with an outstanding mosaic floor of rich patterns and medieval iconography. 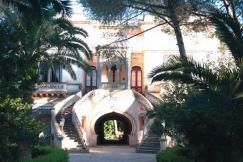 Next you will visit the elegant spa buildings in Santa Cesarea Terme. The route then passes through the Medieval burg of Castro, on its way to Leuca, which sits at the very end of the Italian peninsula and harbors a few elegant 19th century villas. 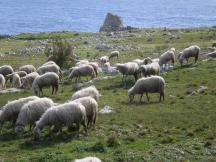 We recommend this trip in both directions – both to and from Otranto – but do keep an eye out for stray flock of sheep that may cross your path! 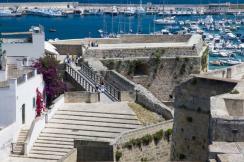 Otranto is praised as one of the Most Beautiful Villages in Italy. 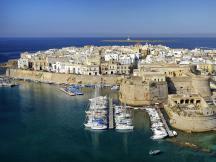 South of Lecce and towards the Ionian Galatina, Gallipoli and Nardò stand out as valuable historical and cultural centers. 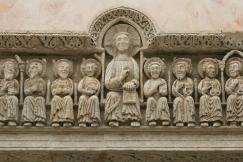 In Galatina the ancient tradition of tarantism is upheld today in series of outdoor summer performances. 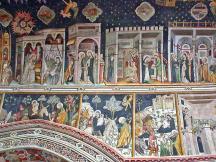 The town displays a number of noble 18th century houses with charming, richly carved portals and boasts the great Franciscan church St. Caterina d’Alessandria fully frescoed by Giotto’s followers. Jutting out into the crystalline Ionian sea is the old center of Gallipoli, adapted from the Greek “Kale Polis,” meaning beautiful in word and deed. This ancient town is like a maze where narrow alleyways open onto intimate courtyards, and huge Baroque facades overwhelm tiny squares. Northwards and across the so-called “Le Cenate,” a country borough dotted with luxury villas surrounded by original woods, sits the little town of Nardò. Like a protective shell, the town of Nardò jealously guards its main square, a Rococo treasure dotted with extravagant Baroque churches and palaces.